The mysterious and often unpredictable world of primates is explained by Smithsonian scientists in a Q&A format. 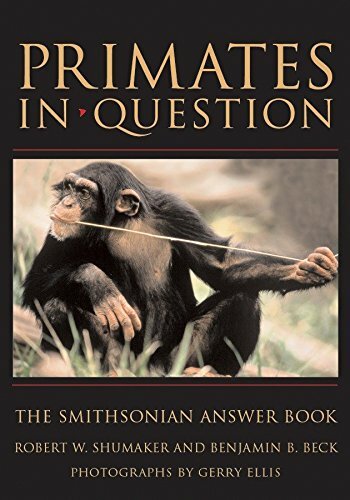 A comprehensive response to the many thousands of calls and letters the Smithsonian receives regarding questions related to monkeys, apes, lemurs, tamarins, and their relatives. What are primates? How closely related are humans to other primates? How strong is a gorilla? Why do primates spend so much time grooming? Why can't apes talk? These and almost 100 other questions are addressed with clear, thorough answers. 99 color photographs. Robert Shumaker is director of the orangutan "Think Tank" at the Smithsonian's National Zoo. Benjamin B. Beck is a primatologist and former associate director of the Smithsonian's National Zoo. Gerry Ellis is an award-winning photographer whose credits include Natural History, Audubon, and National Geographic magazines. 4. PRIMATES IN QUESTION (Smithsonian Answer Book) [Hardcover] SHUMAKER RW.